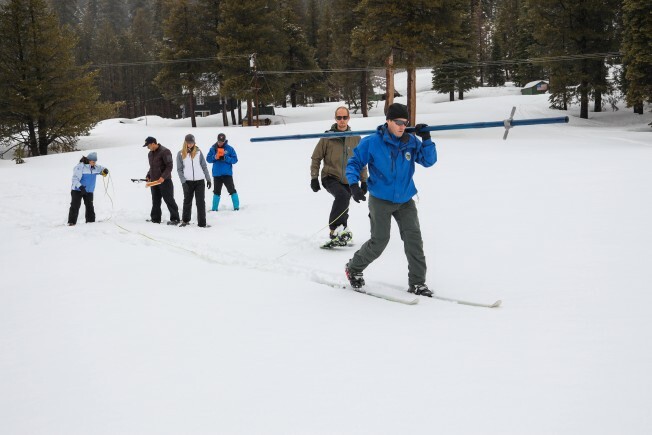 John King, Water Resource Engineer, DWR Snow Survey Section, leads the fourth snow survey of water year, followed by team of members of DWR's excecutive staff. The survey was approximately 90 miles east of Sacramento off Highway 50 in El Dorado County. Photo taken April 2, 2019. The numbers from the most recent survey of snow levels in the Sierra Nevada Mountains in California are staggering, but not unexpected after a winter of unrelenting storms. Tuesday's manual survey at Phillips Ranch showed snowpack at 200 percent of average for that location. Statewide, snowpack was at 162 precent of average. The state's six largest water reservoirs hold between 106 and 132 percent of historical averages for early April. 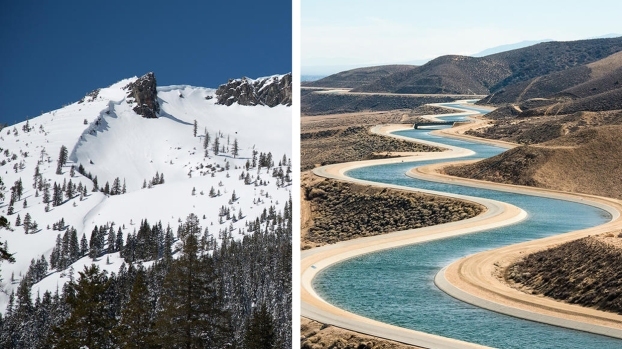 "With full reservoirs and a dense snowpack, this year is practically a California water supply dream," said Department of Water Resources Director Karla Nemeth. "However, we know our long-term water supply reliability cannot rely on annual snowpack alone. It will take an all-of-the-above approach to build resiliency for the future." California has a history of dry spells and wet rain seasons, a pattern on display at Phillips Ranch over the decades. Some surveys were conducted in fields of brown grass. Others required the survey team to trudge through deep snow drifts to reach the survey site. The manual surveys, just off Highway 50 near Sierra-at-Tahoe, are done each winter near the start of January, February, March and April. Manual and electronic readings are taken at other sites in the mountains. The snow along the 400-mile Sierra mountain range melts in the spring in a traditional wet season, runs off into reservoirs ahead of the state's dry, hot summers and provides about 30 percent of California's water. Water managers use a measurement called "snow water equivalent," which is the depth of water that theoretically would result if the entire snowpack melted at once. The Phillips Ranch survey showed a snow water equivalent of 51 inches, which is 200 percent of average. That's nearly triple the snow water equivalent from Feb. 1. The April 3 survey recorded 106.5 inches of snow depth. The monster snowpack brings concerns about flooding this spring. "With great water supply benefits comes some risk,” said Jon Ericson, DWR Chief of the Division of Flood Management. "Based on snowpack numbers, we have the potential for some minor flooding due to melting snow so we remind folks to always stay vigilant and aware."